Astronomy current events question: Europa subsurface ocean oxygen? According to a University of Arizona researcher, what is the proposed source for oxygen that may be found in the subsurface oceans of Jupiter's moon, Europa? (A) Charged particles impacting its icy surface. (B) Water- and oxygen-rich asteroids. (C) Open vents in the ice. (D) Exotic chemical processes on the warm ocean floor. What did the NASA Interstellar Boundary Explorer probe recently find at the edge of the solar system? (B) Large planetoid that will pass close by in late 2012. (C) Ion trails left by the Pioneer 10/11 and Voyager 1/2 probes. (D) Ribbon of energetic neutral particles. (E) Diffuse shell of dark matter. What mission is the joint NASA/European Space Agency James Webb Space Telescope planned to replace? (A) Cancelled Mars sample return mission. (B) Repaired Hubble Space Telescope. (C) Failed Indian Space Agency Chandrayaan moon probe. (D) Recently crashed LCROSS probe. (E) Spitzer Space Telescope, out of coolant. A 1.2 kg block has an initial speed of 0.75 m/s as it slides down a ramp at a point 0.40 m above a horizontal floor. Neglect friction and drag. What is the final speed of the block along the horizontal floor? v_f = sqrt(2*g*y_i + v_i^2) = 2.9 m/s. with v_i = 0.75 m/s, g = 9.80 m/s^2, and y_i = +0.40 m.
Response (C) has v_i = 0; response (B) has a sign error within the square root; and response (A) has both v_i = 0 and a factor error, with v_f = sqrt(g*y_i). (B) Very small dust particles. (C) Dense clumps of large dust particles. Very small dust particles will scatter short-wavelength (blue) light in all directions more than scattering longer wavelengths, such that this nebula will appear blue in color. A massive star has the shortest main-sequence lifetime (typically less than few millions of years, compared to tens of billions of years for the low-mass main sequence stars). 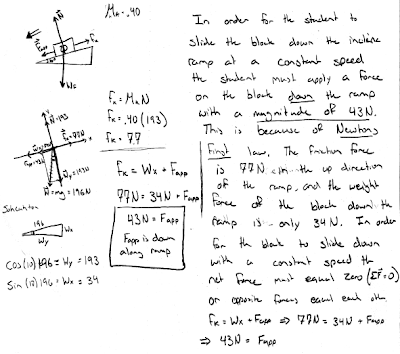 "RC VII class submarine firing torpedoes"
A Physics 205A student drags a sled across the horizontal floor at a constant speed by a rope that is inclined at angle of 20° above the horizontal. What is the sign of the work done by the normal force on the sled? The normal force on the sled is perpendicular to the horizontal displacement, and thus the work it does on the sled is zero. A Physics 205A student drags a sled across the horizontal floor at a constant speed by a rope that is inclined at angle of 20° above the horizontal. What is the sign of the work done by the weight force on the sled? Online reading assignment question: hottest star? "The hotter it gets, the brighter the light; hence white is the hottest." "Because it has white next to it, White is one of the hottest stars"
"because on the Kelvin scale its the hottest, and B is the farthest away"
"it has the hottest temp because its white and its in the A0 quadrant." "The main sequence is about 10,000 degress and the white dwarf is about 7,000"
"OBAFGKM, moving from hottest to coolest. B comes earliest in the sequence, as illustrated on the star chart given in class." "B' stands for blue which is the 2nd hottest colored temp. That means the main sequence star is hotter than the rest, even the white dwarf. "because i'm smart and i pay attention"
"B0 main-sequence is higher than the other choices." "This star has the hottest temperature and the largest luminosity on the star chart"
"according to the memorization tool you had us make up, B comes before all the other letters." "From hottest to coolest, B-A-F-M. Main sequence star is hottest, based on it's letter (B) being second in line for hottest star, behind O." "The white dwarf is the hottest star because white is the hottest you can go on the spectrum." "on the S and G chart b level stars are the hottest." 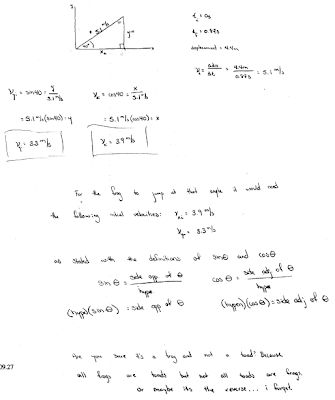 "i looked on the cheat sheet you gave us and using process of elimination, i chose the answer that was correct. to chose any other answer would not be correct." 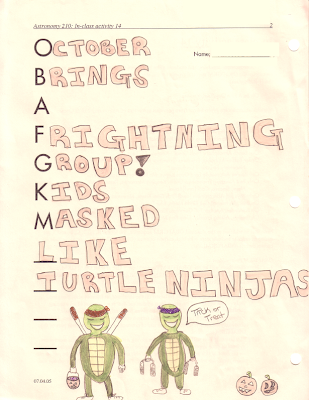 "OBAFGKM or something like that... either way, B comes before A, M, or F"
"B is closet to the left. which is the hottest." "the one that is blue"
"White dwarf is smaller but very compacted and dense"
"O, B, A, F, G, K, M.... This sequence goes from left to right... Left is the hottest, so B0 must be the hottest since there are no O stars available! Right?" "because B is higher surface temp than all the others except for O and on the chart the hottest is main sequence then all the other options." Wordle.net tag cloud for the pre-OBAFGKM Poetry Slam NCC section (http://www.wordle.net/show/wrdl/1240070/Untitled). "Because its between 20,000 and 30,000 in temp in the chart. Its at the farthest left." "The hottest star is M5 because the temperature for stars goes..OBAFGKM." 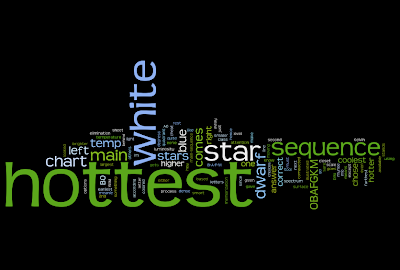 "because the white dwarf star is hot..."
"not really sure...this was just a guess according to figure 7-7 in Ch. 7 readings." "A class-B star has a temperature range of about 10,000 - 30,000 degrees K, which is hotter than any of the other options." "The brighter the main sequence star is the hotter it gets. A 'B' star is the farthest left of these four on the spectrum"
"A0 is the hottest a star can get being over 10000 kelvin"
"has a greater surface temperature on the spectrum then a main sequence star." "white is the hotest color"
"because of the size and luminosity ratio copared to the other stars"
"On the chart we got in class, the BO main-sequence star is the hottest." "I can hardly remember the chart, but i'm sure its the supergiants cuz they are the highest up there on the chart :P"
"according to the graph its the hottest because the sun is about 6000 kelvin and a BO mainsequence has a surface temperature of 20,000 to 50,000 kelvin"
"Color reflects temperature and white is the hottest"
"using the Hertzsprung-Russell diagram we see that A stars are hotter than B,F, and M stars. the number after the letter is simply more specific classification which is in this comparison unnecessary." "because B stars are hotter than the others"
"The red dwarf stretches across to a temperature of 50,000 being the hottest temperature while the others fall short of that degree." "On the star diagram the BO main sequence stars are furthest on the temperature scale." "B0 main-sequence star is the hottest because it is blue, closest to the left." 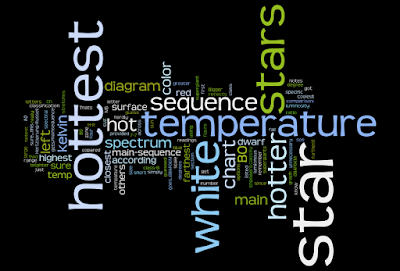 "In the spectral sequence, B stars are hotter than all but O stars which are the hottest." "a supergiant star is the hottest because it is the most lumionous and it has a large section in the highest tempature on the H-R diagram." "White is hotter than red." 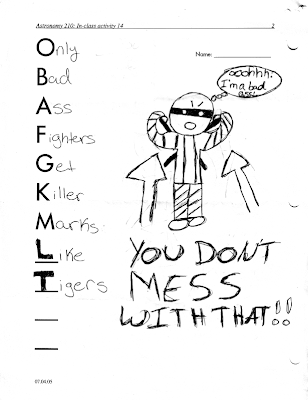 "Because in the sequence OBAFGKM (with O being the hottest and M the coolest), B is the closest to O in the snaswers provided." "Thats what these notes say..."
"because white is the hottest color on the spectrum"
"The first two letters that classify the temp. of stars are O and B since there is no O star listed it would be the star in the B zone." Wordle.net tag cloud for the post-OBAFGKM Poetry Slam SLO section (http://www.wordle.net/show/wrdl/1240073/Untitled). What was the somewhat unexpected result of the NASA LCROSS mission lunar impact? (A) No collision was observed. (B) The impact was smaller than expected. (C) Evidence of liquid water waves. (D) A new faint, tilted ring surrounding the Moon. (E) Brief disruption in satellite TV communications. What was the special occasion commemorated by the White House Star Party, which was attended by the President and the First Lady? (A) Washington D.C. Light Pollution Darkout 2009. (B) 2009 Nobel Peace Prize. (C) NASA LCROSS mission lunar impact. (D) Renovation of the White House Observatory. (E) International Year of Astronomy 2009. According to University of Virginia researchers, what is the source of Saturn's newly discovered tilted ring system? (B) Material from one of its moons. The NASA MESSENGER spacecraft recently made a third and final flyby past Mercury. What is its final destination in 2011? (B) Flying through a solar flare. (C) Crashing into a shadowed crater on Mercury. (D) Polar orbit around the Sun. A white dwarf will be ___________ compared to a red dwarf that has the same luminosity. From Wien's law, white dwarfs must be hotter than red dwarfs. From the Stefan-Boltzmann law (luminosity proportional to size and temperature^4), since the white dwarf has the same luminosity, but is at a higher temperature than the red dwarf, then the white dwarf must be smaller in size. The apparent magnitude would get brighter, as the star would be moving closer to Earth. The apparent magnitude would get dimmer, as the star would be moving closer away from Earth. A main sequence star will be ___________ compared to a giant star that has the same temperature. (A) less luminous and smaller. (B) less luminous and larger. (C) more luminous and smaller. (D) more luminous and larger. From an H-R diagram, main sequence stars that are the same temperature as giants will be less luminous than the giants. From the Stefan-Boltzmann law (luminosity proportional to size and temperature^4), since the main sequence star has less luminosity, but is the same temperature as the giant, then the main sequence star must be smaller in size. Oh Boy, Another Film Goes. Keeping Mediocre Ratings. Never Settle. Comedies! 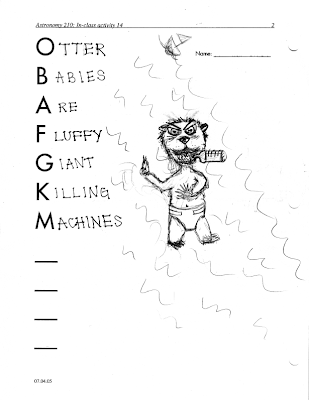 Oh Boy, A Flying Gorilla Killed Ma! Ouch! Bees Are Finally Gonna Kill Me. Obama Bankrupts America; Fact. Gets KGB Membership. Oh Boy, Anyone Feeling Grumpy? Kinda? Maybe? Only Betray A Friend if you're Going Krazy Man!! it's Really Not So Cool. Oh Brother! A Fake Green Killer Mantaray! Our Bees Are Ferocious Ghosts! Killing Me...Like Tycho! Only Bad-A**es For Governor, 'Kay Man? One Big Astronomy Final. God Kill Me. 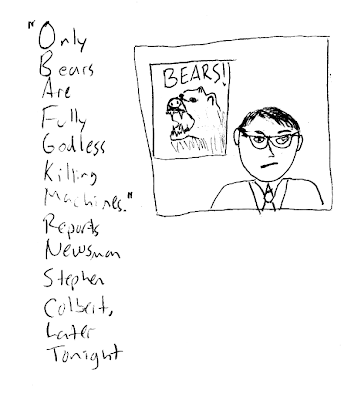 "Only Bears Are Fully Godless Killing Machines," Reports Newsman Stephen Colbert, Later Tonight. Oh Be A Freakin' Guy, Kill Mice Lighting TNT! 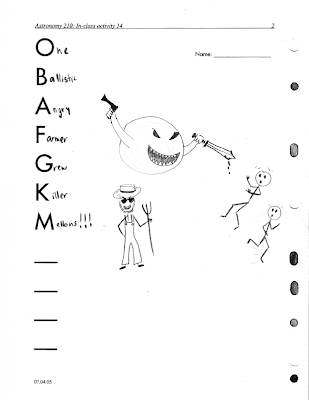 One Ballistic Angry Farmer Grew Killer Melons!!! Shown at right is an excerpt from a comic strip (Baby Blues, Rick Kirkman and Jerry Scott, King Features Syndicate, August 2, 2009). 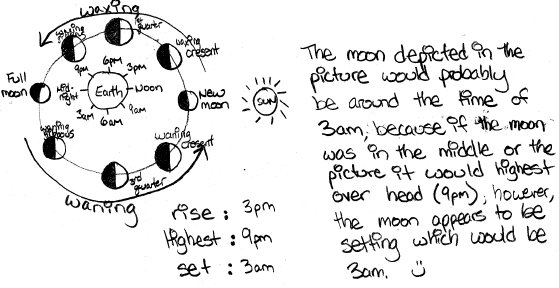 Given the phase of the moon shown here, discuss a plausible time at night for the events depicted in this comic strip, using a diagram showing the positions of the sun, moon, and Earth. Correct. 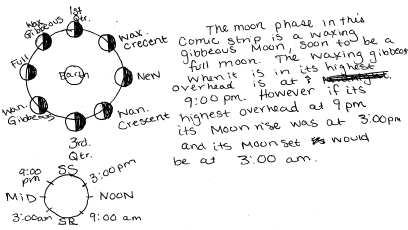 Identifies the phase as waxing gibbous, which is highest overhead at 9 PM (rising at 3 PM, and setting at 3 AM), using a diagram of the sun, moon, and Earth. May choose 9 PM, or anytime between sunset (6 PM) to 3 AM as being a plausible time for the events depicted in the comic strip. Nearly correct (explanation weak, unclear or only nearly complete); includes extraneous/tangential information; or has minor errors. May include 3 PM in a range of plausible times, or diagram has minor inconsistencies/errors. Contains right ideas, but discussion is unclear/incomplete or contains major errors. Problems with either diagram, phase, or time. Limited relevant discussion of supporting evidence of at least some merit, but in an inconsistent or unclear manner. Problems with diagram, phase, and time. "The clickers were quite nice once they were working. I wish there wer a little bit more clicker questions on lecture examples." "They are easy to use." "I think that the clickers are a great idea and can be useful in class discussions. Although in the way that we are using them, simply to turn in answers without understanding the results or review the questions, they are not as beneficial as they could be." "If we used the clickers as a statistical viewpoint only and spent more time reviewing the questions that were asked of us, then the clickers would become more helpful in an education way, opposed to the point/credit purpose they serve now." "I believe that clickers are just another way to get money out of us. They can be useful, but you must buy the clicker and register it. It is too much money. 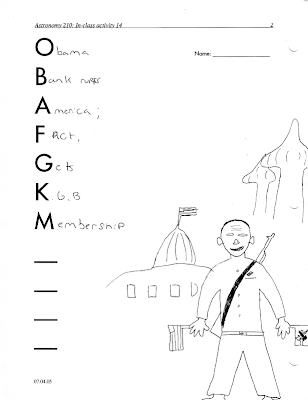 We could have different kinds of quizzes and other kinds of participation in class." "I could take them or leave them." 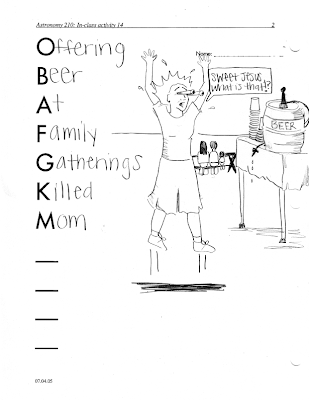 "I think having jump start questions were a good idea, since it made you read the next chapter and I also felt that it helped during lecture to have a 'heads up' on what we were going to cover next." "I think now that we seem to have the clickers all working, that the program is very useful and is a creative way of learning." "I think FALs should be an optional study groups. It is bad enough that we don't get the complete credit time for time spent in class(s). But on top of it, an extra hour is required to force us to work together. The idea of an FAL is great. but it would be much better to have Chemlab like Mathlab, leave it optional. People will work together anyway with friends they make in class during clicker quiz's or in lab. Demo videos are cool but with a lab they are not really needed. its cooler to see it for real in a lab then to see it in a video. I see a lot of interest is directed in the use of clickers. Clickers are fine. The way in which you chose to use them is good and time effective, you don't over use them. and the amount of class time consumed is about 10 minutes per week. so 7% of the in class lecture time is used to help you determine what is least understood. 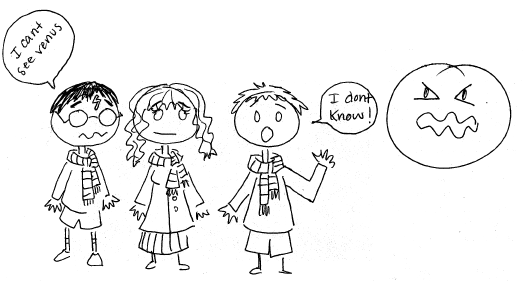 granted people will work together to get answers so the 100% correct may not mean 100% understood. but a low % would grantee confusion. I know there is debate over the effectiveness of clickers. I support them, they are not expensive and they help the teacher keep in touch with their classes progress between tests. 'Clickers helped me understand lectures better.' I agree with this because it adds to exposure and interactivity in the subject. I is like when your having a hour long conversation with someone and after while you kinda zone out. ahuh ahuh ahuh, you know. so this makes you think and apply what your doing. it breaks up the lecture a bit and makes the class more interesting. That said. I believe reading the textbook, being lectured and asking questions is adequate to learn the subject. Your a great teacher, and [the lab instructor] is a great lab instructor. both of you add alot of color and enjoyment to the subject. I feel fortunate to have a positive first exposure to learning the subject. I read a book in the past called Feynman's Rainbow. It was a terrible book by a terrible failed chemist, failed physicist and it turned me off to chemistry. But it turns out that chemistry is no so bad after all." "I do like the option of working with other students for clicker quizes in clas"
"I have no questions, currently." "This class is well balanced in time spent on lecture, demonstrations, using the clicker, and answering questions from students. I had a previous class that used the clicker and I felt that it hindered my ability. However, [the instructor] does an excellent job using the clickers in constructive ways that help the students and also allow her know if the students are understanding the concepts. The clickers are definitely an asset to this class." 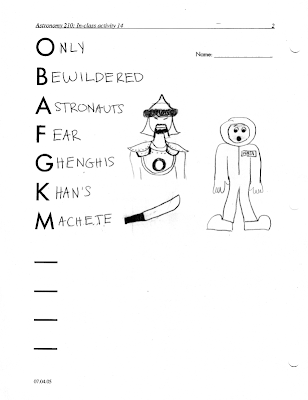 "I am often at a neutral position with clickers because you can just as easily quiz students without them. This change in form would help the students with money because of the cost of not only the clicker but to sign up in the class as well. However it is much easier to link the clickers rather than print out 40 copies of a test, that is why I find myself at a neutral position." "I find the clicker to be a nice tool and great time saver for instructors when grading and record student data, but it's just another material cost to have to afford when I am seem to be struggling already to pay for the textbook, FAL packet as well as chemistry lab booklet." "I think the clicker quizzes are fun and challenging way to get the students to pre-read the course material." "I do not mind the clickers what so ever, my only thing is i found it very expensive. This is the only class i have ever taken that has required the clicker an it was i thought i process. Buying it was thirty dollars, then another fifteen to register the thing. 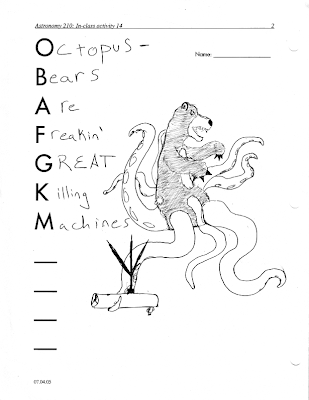 I find using the small ten point scantrons is easier. I can understand that the clicker is faster an better for the instructor, but also expensive for the students." "The only comment I have is that the clickers would be more desirable if they were in the classroom ready to check out each time we use them. Carrying them around and buying them is the only inconvenience. Otherwise I like using them." Astronomy midterm question: midnight Venus? "When [Harry, Ron, Hermione] reached the top of the Astronomy Tower at eleven o'clock they found a perfect night for stargazing, cloudless and still... They entered the precise positions of the stars and planets they were observing... Half an hour passed, then an hour... Harry put his eye...to his telescope and refocused it, now examining Venus." --J. K. Rowling, Harry Potter and the Order of the Phoenix, Scholastic (2003), pp. 718-719. Discuss whether this is plausible or implausible. Support your answer using a diagram showing the positions of the sun, Venus, and Earth. Correct. 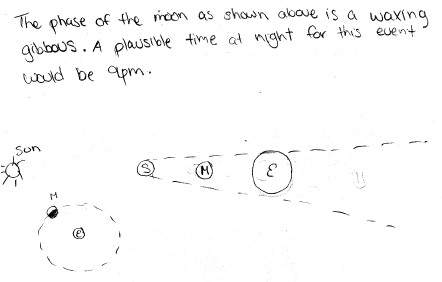 Discusses the implausibility of this scenario by drawing a diagram with Venus' orbit closer in to the sun than Earth's orbit, making it not possible for midnight observer (assumed to be at/near the equator) to observe Venus anywhere in its inner orbit. Nearly correct (explanation weak, unclear or only nearly complete); includes extraneous/tangential information; or has minor errors. Draws Venus in a geocentric orbit (and along or near the sun-Earth line) and argues implausibility based on this model (which is incorrect, but does reproduce the relative maximum possible angular separation between the sun and Venus). Contains right ideas, but discussion is unclear/incomplete or contains major errors. Argues plausibility based on a problematic heliocentric diagram, with Venus' orbit larger than Earth's orbit. Or argues implausibility based on a correct heliocentric diagram, with Venus' orbit closer in to the sun than Earth's orbit). Limited relevant discussion of supporting evidence of at least some merit, but in an inconsistent or unclear manner. May discuss evening/morning star nature of Venus, elliptical orbital shapes, prograde/retrograde motion, phases, etc. [20 points.] Decide whether a proposed radio telescope should be placed on the ground or in outer space in order to be most cost-effective and be able to most efficiently gather astronomical data. Explain the reasoning behind your decision, in terms of relevant criteria discussed in this class. Correct. In general, the atmosphere is relatively transparent to radio waves, such that a ground-based telescope would be cheaper and just as effective as a space-based radio telescope. May argue for high-altitude or space-based radio telescopes for specific wavelengths that the atmosphere is relatively opaque for (e.g., FM/AM). Contains right ideas, but discussion is unclear/incomplete or contains major errors. Does not specifically discuss the relative transparency of Earth's atmosphere to radio waves, but only in general terms such as disruption, inteference, distortion. [20 points.] Shown at right is an excerpt from a comic strip (Wizard of Id, Brant Parker and Johnny Hart, Creators Syndicate, June 28, 2009). 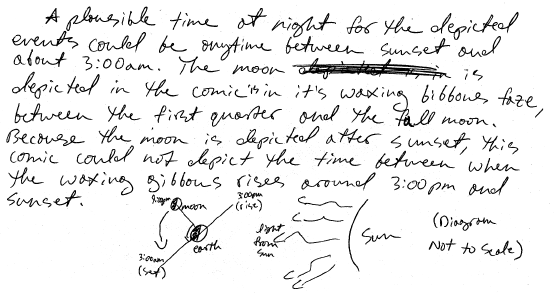 Given the phase of the moon shown here, discuss a plausible time at night for the events depicted in this comic strip, using a diagram showing the positions of the sun, moon, and Earth. Correct. Identifies the phase as waning crescent, which is highest overhead at 9 AM (rising at 3 AM, and setting at 3 PM), using a diagram of the sun, moon, and Earth. 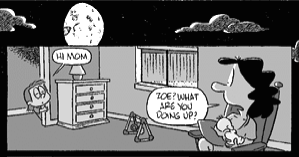 May choose anytime between 3 AM to 6 AM (sunrise) as being a plausible time at night for the events depicted in the comic strip. Nearly correct (explanation weak, unclear or only nearly complete); includes extraneous/tangential information; or has minor errors. 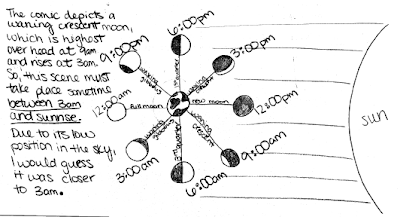 May include 9 AM or any time after sunrise, or diagram has minor inconsistencies/errors. "When [Harry, Ron, Hermione] reached the top of the Astronomy Tower at eleven o'clock they found a perfect night for stargazing, cloudless and still. The grounds were bathed in silvery moonlight... Each of them set up his or her telescope and...entered the precise positions of the stars and planets they were observing..."
--J. K. Rowling, Harry Potter and the Order of the Phoenix, Scholastic, New York, NY, 2003, pp. 718-719. Discuss both the ideal and non-ideal conditions that would have affected telescopic observations on that night. 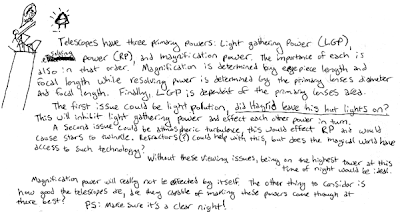 Support your answer using factors that relate to the three telescope powers. Correct. Ideal: lack of atmospheric turbulence means that resolving power is not adversely affected. Non-ideal: moonlight will adversely affect the light-gathering power to image fainter stars. Nearly correct (explanation weak, unclear or only nearly complete); includes extraneous/tangential information; or has minor errors. Discusses both ideal and non-ideal factors, but one citation from excerpt is problematic; or most generally discusses all factors that may affect viewing, but does not specifically apply it to the excerpt. Contains right ideas, but discussion is unclear/incomplete or contains major errors. Correctly discusses only one of the ideal/non-ideal conditions specified in the excerpt. Astronomy midterm question: low west sunset Venus? "The stars were just now appearing, but to the west, a single point of light glowed brighter than any other. Langdon smiled when he saw it. It was Venus." --Dan Brown, The Da Vinci Code: A Novel, Random House, New York, NY, 2003, p. 589. Correct. Discusses the plausibility of this scenario by drawing a diagram with Venus' orbit closer in to the sun than Earth's orbit, making it possible for an observer at sunset to observe Venus low on the west horizon. Nearly correct (explanation weak, unclear or only nearly complete); includes extraneous/tangential information; or has minor errors. Draws Venus in the correct position in its orbit relative to Earth such that it would be seen just after sunset, but concludes that this would be implausible. Contains right ideas, but discussion is unclear/incomplete or contains major errors. Argues plausibility or implausibility based on drawing Venus in its orbit relative to Earth such that it would be visible in the east horizon at sunrise, or is transiting the sun. Limited relevant discussion of supporting evidence of at least some merit, but in an inconsistent or unclear manner. Draws a problematic diagram with Venus' orbit larger than Earth's orbit, or in a geocentric orbit around Earth. Implementation/application of ideas, but credit given for effort rather than merit. Incomplete/inconclusive diagram, or argument based on retrograde/prograde motion. [20 points.] 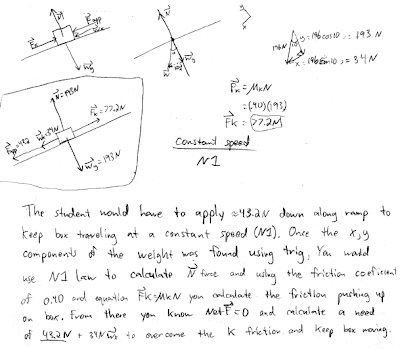 A Physics 205A student wants a 20 kg box to slide with constant speed down a ramp that is inclined 10° from the horizontal. The coefficient of kinetic friction between the ramp and box is 0.40. 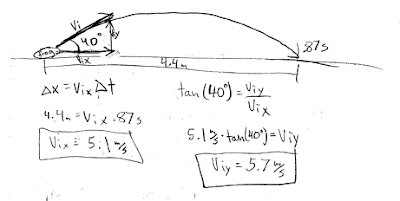 What direction (up along the ramp, or down along the ramp) and magnitude force should the student exert on the box such that it slides down the ramp with constant speed? Assume that the box has already been unstuck. Show your work and explain your reasoning. Correct. Resolves weight into w_x and w_y components (parallel and perpendicular to ramp, respectively). Then applies Newton's first law along the (tilted) y-direction to find normal force of ramp on box, and thus f_k = mu_k*N (pointing up along the ramp). Since f_k up along the ramp is larger than w_x down along the ramp, F_applied needs to be the difference between their magnitudes f_k - w_x. Nearly correct, but includes minor math errors. Typically uses N = w = m*g or N = w_y = m*g/cos(10 degrees) instead of N = w_y = m*g*cos(degrees); or sets F_app = f_k only, neglecting w_x component, otherwise methodical application of Newton's first law along y- and x- direciton. May also have sines and cosines switched, calculator was used in radians mode, or spurious force/component added back in. Nearly correct, but approach has conceptual errors, and/or major/compounded math errors. Some attempt at resolving w into components on a substantive free-body diagram, and/or methodical application of Newton's first law along (tilted) y- and x- directions. 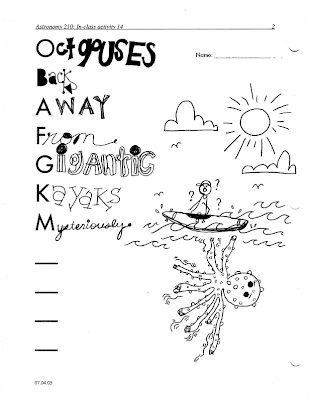 May have two errors/omissions of those described in (r). Implementation of right ideas, but in an inconsistent, incomplete, or unorganized manner. 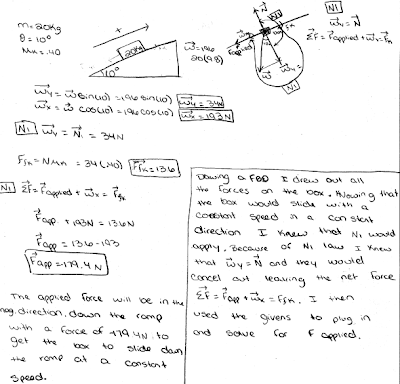 Serious attempt at free-body diagram and application of Newton's laws. [20 points.] 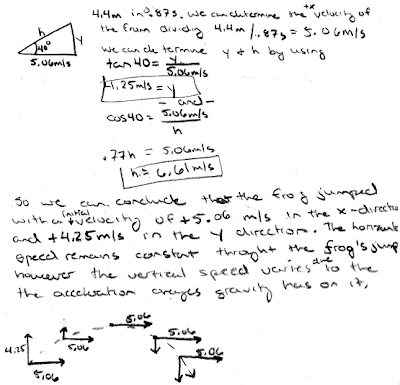 A frog jumps at an angle of 40° from the horizontal, and lands back on the level ground 0.87 s later, a distance of 4.4 m away. 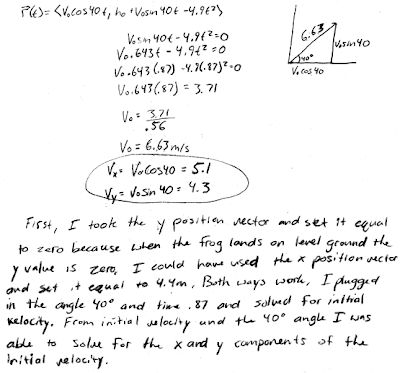 Solve for the x- and y-components of its initial velocity. Show your work and explain your reasoning. Correct. Solves for average horizontal speed from given horizontal displacement and elapsed time, this must also be the initial horizontal velocity component vix. 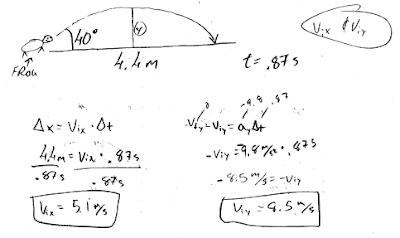 Then can use the initial trajectory angle to solve for viy = vix·tan(40°). Or can use half of flight time, and vfy = 0 at top of trajectory to find viy . Nearly correct, but includes minor math errors. May have shifted a decimal place, or used tan(40°) = adjacent/opposite, or apparent miscalculation of otherwise correct equations. Nearly correct, but approach has conceptual errors, and/or major/compounded math errors. At least has vix = ∆x/∆t. Garbles attempt at using kinematics to find viy (typically using 0.87 s as the time to travel to its highest height). Implementation of right ideas, but in an inconsistent, incomplete, or unorganized manner. Still has a methodical approach based on kinematics and/or trigonometry. May claim that ∆x/∆t is the magnitude of the initial velocity vector, which is then broken into vix and viy components using cos(40°) and sin(40°). What properties of x-rays make it possible for the NASA Chandra X-ray Observatory to study the center of the Milky Way? Circle your answer below. (A) Not blocked by interstellar gas and dust. (B) Can escape from the central supermassive black hole. 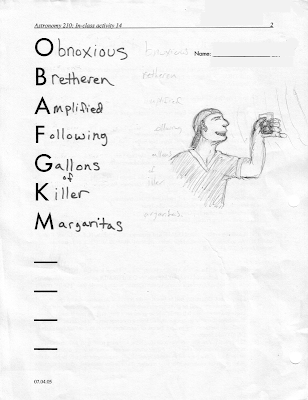 (C) Energetic enough to disrupt ground-based instruments. (D) Not detectable anywhere on Earth. (E) Readily passes through the Earth's atmosphere. What have several scientists proposed as the cause of varying infrared light from a dusty disk around the star LRLL 31, detected by the NASA Spitzer Space Telescope? Circle your answer below. (A) Outer layers of the star, as it becomes a planetary nebula. (D) A companion star or planet swirling material together. (E) A black hole passing in front of the star. According to a University of Maryland researcher, what may be the source of surface water on the Moon detected by both the NASA Deep Impact mission and the India Chandrayaan-1 spacecraft? Circle your answer below. (A) Solar wind reacting with Moon rocks. (B) The large impact that originally formed the Moon. (C) Contamination from the Apollo 11 mission. (A) low over the east horizon. (B) somewhere high up in the sky. (C) low over the west horizon. (A) An x ray detector on a remote ocean platform. (B) A visible light telescope on the moon. (C) An ultraviolet detector in space. (D) An far infrared telescope in the Mojave desert. X-rays and far infrared both do not penetrate the atmosphere to sea level. A visible light telescope on the moon would be much more expensive than a comparable Earth-based ground telescope. Since ultraviolet does not penetrate the atmosphere, it would be necessary to move it into space to make observations.